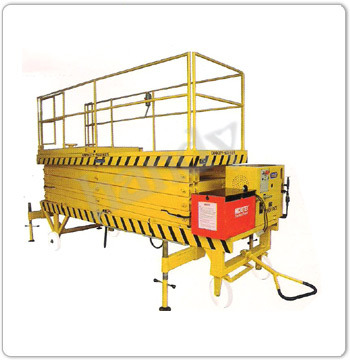 Our company have designed and developed these HIGH RISE MAINTENANCE SCISSOR LIFTING PLATFORMS which are performing to the full satisfaction of the users in various parts of the country and abroad . These scissor platforms can be rolled from one place to another by pulling or pushing very swiftly . All four wheels have double ball bearings with dust covers, for smooth running. The working platform has got the necessary railings for human safety. Out riggers (holding) are provided at base platform for locking and more safety while raising the platform. In raised position the frame does not swing or sway, which gives a feeling of safety and security to the operator. 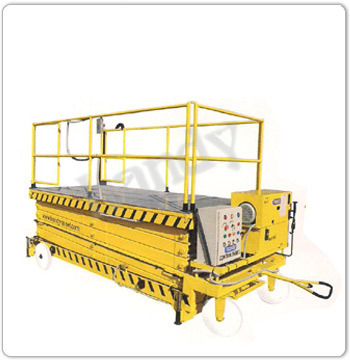 One person can handle the job by this type of Lifting platform under Hydraulic cushion. Electric push buttons are provided on the control panel at base platform as well as on the Pendent over the working platform for raising and lowering the table. 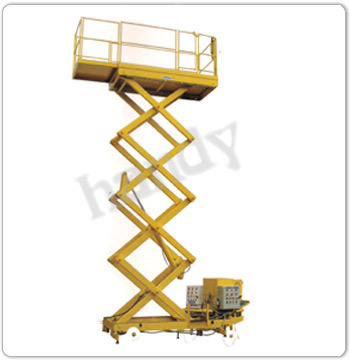 For comparatively lower heights and low frequency of operation " hand operated lifting platform" is also available , where lifting and lowering arrangement is located on the working platform itself by which the workman standing on the working platform can lift/ lower by hand .